The sun is shining in the Abysmal Woods where you�re strolling without a care in the world, your weapon at your belt, dreams of adventure in your head. On your path, you stop before a damaged dungeon door. It seems that great battles took place here, a sure sign of coveted treasure inside. You recognize this dungeon from the ballads sung in your village! However, you�re not the only one who wants to enter, despite the warnings left around the entrance by the previous adventurers. Will you muster your courage to break open the door or will you let your opponents brave the monsters found inside? Let the adventure begin! 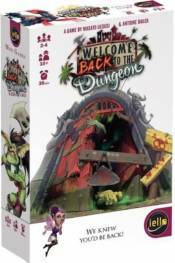 Welcome Back to the Dungeon is a simple and subtle push-your-luck game in which you�ll need to adopt a show of bravado or outwit your opponents!